The following terms and abbreviations are used in this help file, monitoring client, Web interface, and IPHost Network Monitor online content. The terms are ordered alphabetically. A specific service module that can be installed on a separate host (not on the main monitoring host) and can be connected with the monitoring service. Remote Agent allows you to monitor resources in partially isolated networks that can’t be accessible by the main monitoring service directly. The main monitoring service can be referred to as Local Agent. See a detailed description: Remote Agents. A command or command sequence to be executed by the monitoring system. Alerts are linked to monitors via alerting rules that define system behavior on resource state changes or events. Alerts themselves are not associated with state changes and/or events. An alert example is: send an e-mail message to Administrator. There is a global list of named alerts on the Settings dialog Alerts page. A set of alerts linked to monitor state transitions or events that trigger an alert in the set. If a monitor changes its state or causes an event, the corresponding alert is triggered. An alerting rule with two alerts example is: send an e-mail message to administrator for state changes to Warning and Down and show a pop-up message for each state change. You can combine as many alerts as you wish in a given alerting rule. Alerting rules define how the monitoring system responds to monitor state changes and events. The framework is flexible: there is a list of global alerting rules in the Settings dialog, and you can assign any alerting rule to a given monitor. Also, a monitor can inherit an alerting rule from its parent host. Further, a custom alerting rule can be assigned to a given monitor. A tree node: a result of applying an application template to a given host. It contains all the monitors from the template applied to the host and, possibly, monitors added by user. See a detailed description here. A monitor can trigger an event even if its state doesn’t change. For example, the SNMP Generic Trap monitor listening for a specific trap turns to OK state after getting the first trap and then it triggers an event without changing the state every time it gets the next trap. You can assign alerts to an event the same way as for state changes; for instance you can get the system to send an e-mail message to Administrator. A device with an IP address assigned. A host is a set of resources that can require monitoring. A group of hosts of the same kind. For instance, a Servers group contains all server hosts configured for monitoring. If you add a host to the monitoring system manually, you can select a host group via a drop-down list on the New Host page. On network discovery, hosts are placed in either Servers or Desktops and Notebooks groups by default. To change the host group afterwards, you can use the Change button in the Name and Grouping section of the Main parameters tab for the host. In order to create a new Host Group, select an Agent (Local or Remote) and use the New Host Group entry from its context menu. It is possible to create nested host groups to organize hosts the way you need. Diagnostic messages produced by system components. A monitoring client and monitoring service write log messages to the database; you can access them from the monitoring client using the Logs Pane. There are two kinds of messages: system messages and monitor-specific messages. The Apache Web server that provides the system’s Web interface writes standard access.log and error.log files to the logs subdirectory of the IPHost Network Monitor directory in the common application data directory such as C:\ProgramData\IPHost Network Monitor\logs on Windows Vista or Windows 7 or later versions. The monitoring service writes the service.log file to the same directory. Log files are rotated according to logging settings. A specific time period when specified host resources are considered unavailable but do not generate alerts. By default, hosts are monitored permanently (no maintenance interval is configured). See a detailed description here. A logical system unit that monitors a certain resource. A monitor accesses a resource on a particular host in accordance with monitoring parameters such as Polling Interval, Port Number, and so on. A monitor also has parameters that specify how to distinguish resource states and what alerts should be triggered on state changes or events. A group of monitors for the same resource kind. For example, the POP3 monitor type logically groups all POP3 monitors. A group of monitor types for the same target area. For instance, the Mail monitor category logically groups SMTP, POP3, and IMAP monitor types. A periodic process that checks resource availability and performance. This component is a Windows GUI application available from the Program Files menu and through the Desktop icon. It is used to browse and change the monitoring system configuration and to view reports, graphs, and logs. It is described here. This component is a Windows service that performs network discovery, monitors local or remote network resources, delivers notifications, executes alerts, writes logs, and collects monitoring data. It is described here. An automated search for hosts and their particular resources. It can be started either manually or on schedule (periodic rediscovery) as explained here. A single resource check. Monitors do polls at certain intervals; you can also do a poll manually from the monitoring client. HTML pages generated by the reporting module on the Apache Web server. You can access summary reports for default reporting period (usually 24 hours) from the monitoring client. You can access Summary, Problems and Trends reports for any period from the Web interface. In addition, you can receive Daily, Weekly and Monthly Summary, Problems and Trends reports over e-mail as explained here. An entity that is subject to monitoring. Typical resources are services provided by hosts (HTTP service, SMTP service, Database servers, etc. ), files, directories, physical hardware components (CPU, memory, network cards), and so on. It is a named timetable that defines weekly maintenance periods and repeating alerts. A schedule can be created and configured on the Schedule Settings page . Parameters that define monitoring system behavior. Global settings accessible through the Settings dialog apply to the entire system. Individual parameters for monitors, hosts, and monitor groups are available in the Main parameters, State conditions and Alerting tabs of the Parameters/Results Pane. Monitors have a number of parameters that control their behavior. Hosts, monitor types, and other monitor groups also have parameters that can be used as templates for individual monitor parameters, as comments for Web reports, etc. A monitor attribute that depends on monitoring results and configuration settings. A monitor can be active or inactive; active monitors are polled periodically and can be in one of the following states: OK, Warning, Down, Unknown. Inactive monitor states are: Stopped, Stopped by Dependency, on Maintenance or Discovered (not started after being discovered). The monitor states are described here. Note that the terms monitor state and resource state are synonyms and can be used interchangeably across the documentation. OK: recovery from one of the ‘bad’ states (Down, Warning) back to OK.
You can assign alerts to any of the three state changes above; for instance, you can get the system to send an e-mail message to Administrator on any state change. No state change occurs if resource monitoring has been canceled while in a certain state and then resumed (either manually or due to Maintenance or by Dependency) because the previous ‘active’ state of the resource is remembered. The rules that define when a given monitor should switch from one state to another are named State conditions. Each state condition consists of several (one or more) sections, and each section contains a single rule, for example, a list of the values that are accepted as a monitored service response codes. A set of preconfigured monitors with state conditions. A template can be applied to a given host, so that all the template monitors will be created on the host at once. Templates Community is an informative online resource containing many additional application templates and knowledge base articles. Templates are reviewed by IPHost team and you can gain access to approved ones right from the IPHost client. You can also publish your templates and subscribe to digest e-mails. A file attached to template. Attachments can be of two types: SNMP MIBs and all other files, for example, scripts or programs. Content of attachment file is embedded in template. Attachment files will be placed either in predefined standard directory – those attachments are called standard, or they can reference some other files on a file system – such attachments are called custom. Those attachments can be referenced from template monitors. For example, you can create script for monitoring some resource and add this script as template attachment. Then you can refer to this script in Script or Program template monitor or use path to this template attachment in some monitor setting. It is a process of creating template attachment on file system. 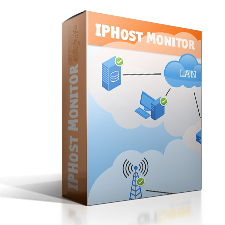 When template is added to IPHost Network Monitor, it is stored in database together with its attachments. Those attachments that are designated to be placed in predefined directories (standard attachments), are created on file system as well. And attachments with nonstandard paths (custom attachments) are not created on file system, unless “Deploy” flag is set manually. It is a platform-specific set of user credentials that the monitoring service uses to access a resource on a target host: Domain/Username/Password for resources on a Windows host, Username/Password for resources on a UNIX-like host (or other resources that require a Username/Password pair, such as SMTP or POP3/IMAP mail servers), and a Version/Community or Version/Username/Password/Encryption key for SNMP resources. This component is a URL available from the Program Files menu; the Apache Web server provides access to this URL. The Web interface allows you to view reports and graphs showing the current system state or monitoring results for any time interval, from any Internet browser-enabled device including mobile devices. It is described here.